The bestselling author of Damaged tells the true story of Donna, who came into foster care aged ten, having been abused, victimised and rejected by her family. Donna had been in foster care with her two young brothers for three weeks when she is abruptly moved to Cathy's. When Donna arrives she is silent, withdrawn and walks with her shoulders hunched forward and her head down. Donna is clearly a very haunted child and refuses to interact with Cathy's children Adrian and Paula. After patience and encouragement from Cathy, Donna slowly starts to talk and tells Cathy that she blames herself for her and her brothers being placed in care. The social services were aware that Donna and her brothers had been neglected by their alcoholic mother, but no one realised the extent of the abuse they were forced to suffer. The truth of the physical torment she was put through slowly emerges, and as Donna grows to trust Cathy she tells her how her mother used to make her wash herself with wire wool so that she could get rid of her skin colour as her mother was so ashamed that Donna was mixed race.The psychological wounds caused by the bullying she received also start to resurface when Donna starts re-enacting the ways she was treated at home by hitting and bullying Paula, so much so that Cathy can't let Donna out of her sight. As the pressure begins to mount on Cathy to help this child, things start to get worse and Donna begins behaving in erratic ways, trashing her bedroom and being regularly abusive towards Cathy's children. Cathy begins to wonder if she can find a way to help this child or if Donna's scars run too deep. "Donna was so traumatised by the treatment her family meted out to her that she wouldn't look anyone in the eye and walked with a stoop. 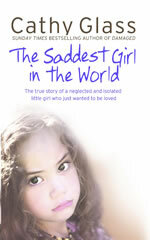 This sad tale is moving and shows how patience and understanding will often help the most damaged of children." "Like all of Cathy's books, it is amazing. I feel like I know Cathy and her family, as well as the children she has written about. I have found all of her books hard to put down once I start to read them." "a good … insight into the world of fostering and social work." "Having pre-ordered this book months ago I was looking forward to reading it, as I thought all her other books were great. Once it came through my door and I had opened it, that was it, I was reading it for the whole day. As with all of Cathy's other books this one was very hard to put down. Cathy is an inspiration to all, and if you have not read any of her books, I would suggest in doing so."